"In regard to the early history of them (our ancestors), I can't inform you as I was never with my grandparents to learn of them." Laban Hause, in a letter to his cousin James Dwight Hause (1901). As the Twentieth Century began, Laban Augustus Hause became somewhat introspective as he reached the age of seventy, looking back on a life well-lived and a heritage that he barely knew. Little of our family's history was available to him. His mother, Jane Jones-Hause, had died while he was a teenager, and he was apparently never told of her family origins, because we have no records of her ancestors at all. Just as unfortunately, his knowledge of the Hause family history wasn't much more informed. So Laban began to trace his family roots with a distant cousin, named James Dwight Hause (b. 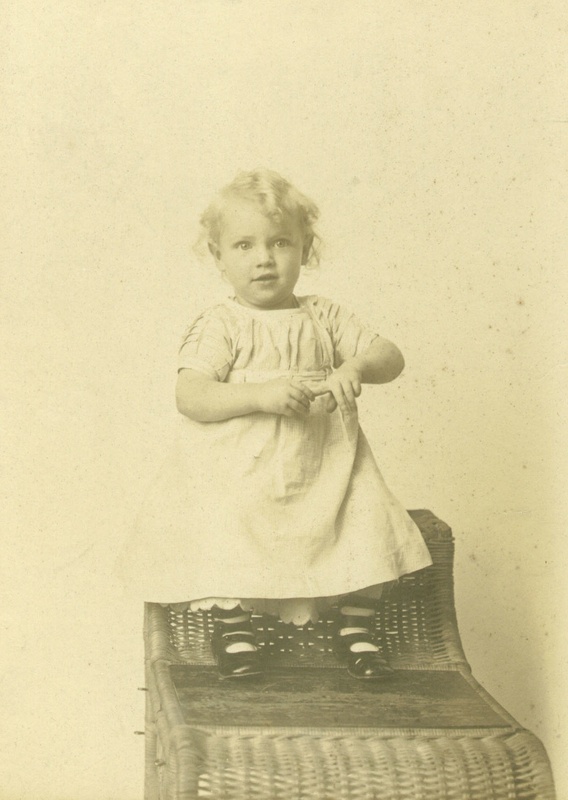 1866, the son in "J.B. HAUSE & SON FURNITURE AND UNDERTAKING"), who was also descended from John Hause and Esther Ketcham-Hause of Fayette, through their son, John Jr. This was an important milestone in our family history, because Laban was (as far as we know) the first Hause in our line to write down a family history, as limited as it was. Before Laban and Melissa, all we have to go on are sparsely recorded government documents, a few church records, and fuzzily-recalled anecdotes handed down at bedtime through the generations. Still, much of the past was already lostto the point that in his letter to J.D. Hause, Laban mistakenly believed that his great-grandparents, William and Martha Hause, had sailed to America from England! He wrote: "Great Grandfather Hause came from England," but admits he doesn't know for sure. So Laban referred J.D. instead to his aunt: "I think you might ascertain from Aunt Carolyn Gage." But Aunt Caroline (sister of Laban's father Augustus Hause) seemed even more confused than Laban. She was seemingly even unaware of William, or of his exploits during the American Revolution. She was beginning to fail physically and probably even mentallyand had come to believe that her parents, John and Esther Hause, were immigrants! When she wrote back to James Dwight, she said: "Father and Mother came to America after they were married .... Father was English. Mother was Dutch. I have heard Mother say many times they were eleven weeks on the ocean." 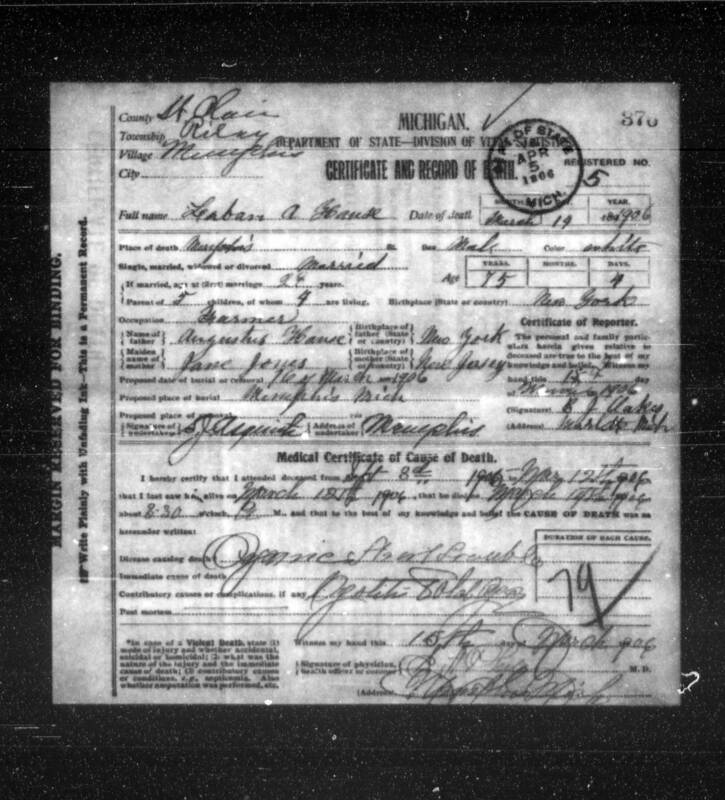 Today, with the Internet, DNA tests, and reports from dozens of professional genealogists to review, we have too much proof of John springing from William and Martha Hause for that to be a possibility. "Joseph Hause (son of William) was one of the pioneers of Seneca County, and helped to clear up the virgin forests around Farmer. He and an Irishman (ex-Senator Francis Kernan's father) went across Seneca Lake and settled in Tyrone, to which point they presently removed their families. 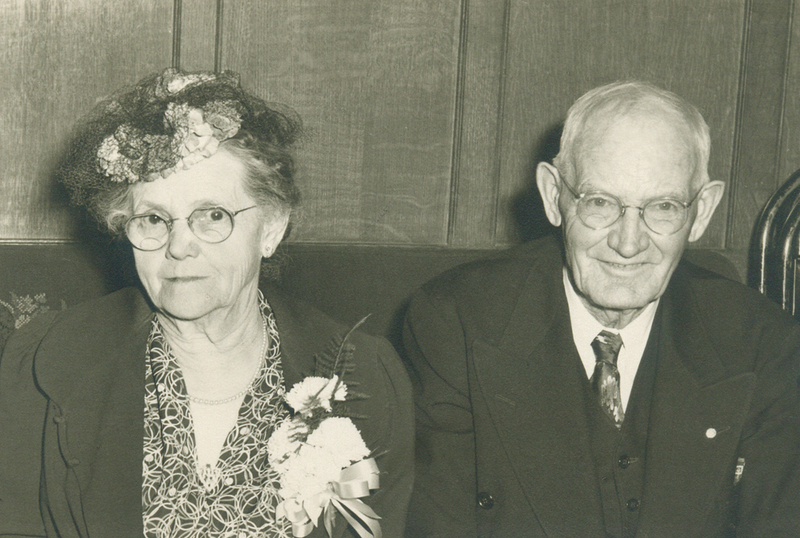 The Hause family trace their ancestry back to William Hause, who settled in Pennsylvania in 1750." "Portrait and Biographical Record of Seneca and Schuyler Counties, New York (Chapman Publishing Company, 1895). The above story was written in 1895, by an anonymous author for a biography of Thomas Purdy Hause (29 Jan 1860 - 24 Jan 1929), the owner and publisher of The Interlaken Review, and a great-great grandson of William E. Hause (through his son, Joseph, 24 Mar 1821 - 18 May 1864). We know this Pennsylvania story to be wrong, as it's been proven that William Hause was born in Rockland County, New York, in 1750, before moving through Pennsylvania in the early 1800's, on his way into Seneca County. He was probably confusing William with his maternal great, great, great grandfather, William Purdy (13 Jan 1745 - 13 Sep 1825), who was a private in the Pennsylvania Militia during the Revolutionary War (see an SAR application here). "The John of the sketch I sent you, was transported from Germany in 1690, he married an English woman, does not Mrs. Gage get her idea from this? I am of the opinion that this John was the grandfather of William, and the great-grandfather of John who married Esther Ketchum. There were fourteen in the same generation of John and I have the place of their residence in all cases except one one of the 11 that married, the second child of William, Jonathan died while on a visit to his aunt in the island of Jamaica, Johanna and Allen died young, it would seem as if the last must have been named for his grandmother, the Sarah Allen that John the 1st married. I have an indistinct recollection of having seen and read the balance of that portion of the history as I find it now in the old Bible, and that it came directly down to William, but it was so long ago that I first saw it, that I cannot now tell where it connects, and came to the conclusion from the age of John about 60 at the time William was born that he was his grandfather." Letter from Alfred Hause to James D. Hause, 28 Jan 1904. Alfred began his research with a family history written in 1850 by his uncle, Lewis K. Hause (born 6 Aug 1818), as well as the family bible of Albert's father Joseph Hause, Jr. (grandson of William), that Thomas apparently forgot or hadn't known about. The character sketches and bible appear to be the source of the entire Sarah Allen legend (and still is, as no contemporary evidence has ever been found), but both of these sources are now lost, and their accuracy can't be confirmed. Then Alfred and distant cousins James P. Hawes (descended from William's son, Jonas) and the aforementioned James Dwight "J.D." 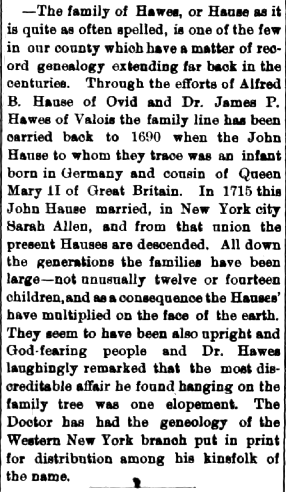 Hause, teamed up to trace the Hause family all the way back to John Hause of Haverstraw, deducing that his origins were from Germanyand also uncovered some interesting stories about William. It was James Dwight who approached Laban and Caroline for the family histories shown above. A letter detailing their research is at left. 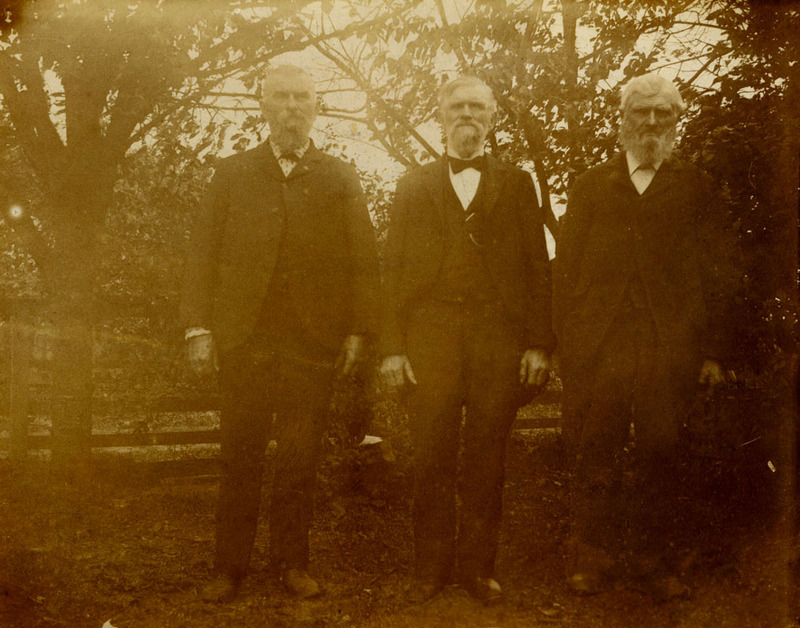 Augustus Hause, Jr., Laban Hause and John Hause pose together at a family reunion in the early 1900's, probably at the funeral of Fannie Hause in New York. 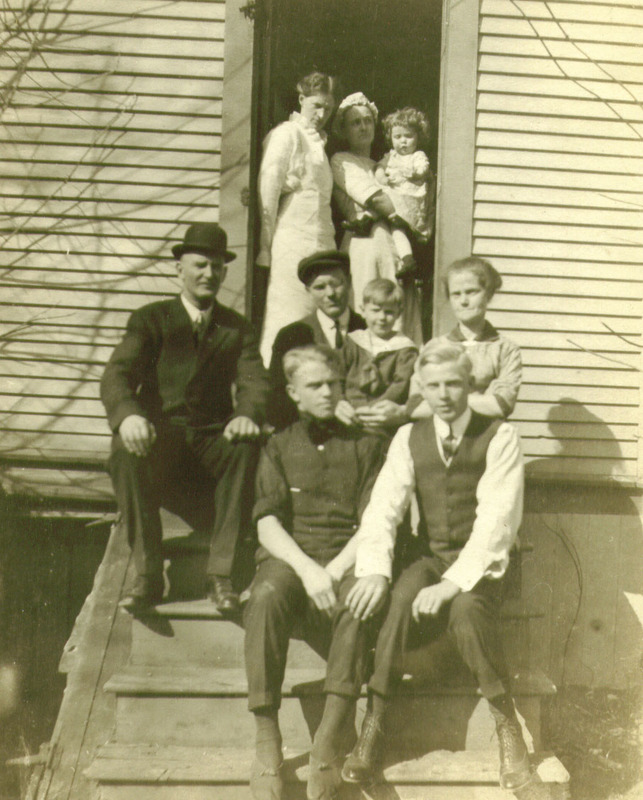 Fortunately, the Hause family is much easier to trace throughout the 20th Century, thanks to the records of the now-literate family members, photographs, and especially the more exacting census records. The U.S. population was 75,995,000. There were only 8,000 cars, and only 144 miles of paved roads; The maximum speed limit in most cities was 10 mph. In 1903, the distinguished astronomer Simon Newcomb stated, "Aerial flight is one of that class of problems with which man can never cope." Later that same year, the Wright brothers proved his theory extremely wrong. The average wage was 22 cents an hour; The average worker made between $200 and $400 per year. Two of 10 adults couldn't read or write. Only 6 percent of all Americans had graduated high school; Ninety percent of all physicians had no college education. A fine of $25 could be levied for flirting in New York. Men were prohibited from turning around on any city street and looking "at a woman in that way." A second conviction for the crime would result in the violating male being forced to wear a "pair of horse-blinders" whenever he took a stroll. December 19, 2005: The Dawson City hockey team began a 9-day walk to get a boat to Seattle to catch a train to Ottawa to play in Stanley Cup on January 13. In 1912, former President Teddy Roosevelt sued Iron Ore, a newspaper in Michigan's Upper Peninsula, for slander after it accused him of public drunkenness. He won six cents. 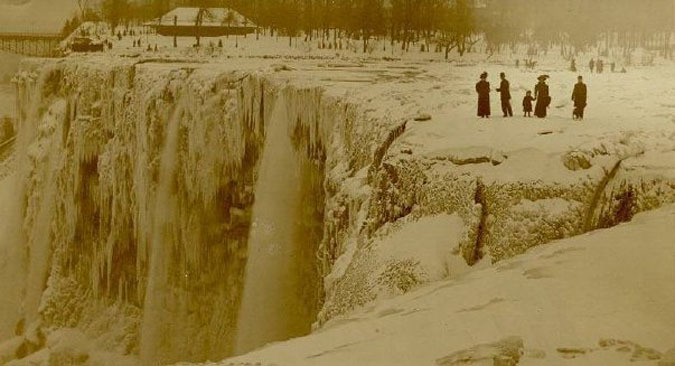 In April of 1909, the area where Laban had moved from, in Niagara County, New York, became so cold that the American side of Niagara Falls froze solid (pictured below). People were able to walk on the river bed just above the falls where there was normally water. Our line in Michigan entered the 20th Century quietly. But Main Street in Memphis was being fitted with a new-fangled gasoline-powered streetlight, suspended by wires from buildings on each of the four corners, and more changes were coming. Laban was now living downtown as well, with Melissa and Edith. Retired from farming and sales, he declared his official source of income as "landlord" in the census, while Frank was listed as a merchant in dry goods. 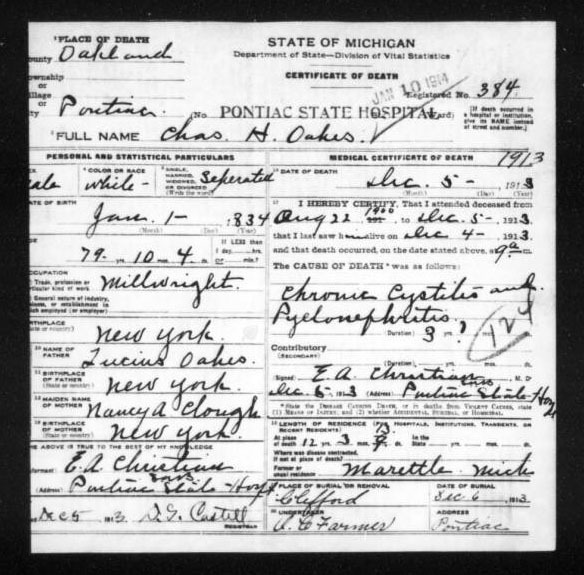 On October 1st of 1900, Fladella had another boy, FREDERICK CLINTON HAUSE. But he lived just under a year, passing on October 2, 1901, and no photographs of him exist. Then looking for a fresh start, Frank and Fladella moved again in 1905, renting the Taylor House at 81521 Belle River Road in Memphis.³ Meanwhile, Fladella's dad, Albert Raymond, became the postmaster, and his family lived just down the street from Laban and Melissa Hause, where Maple intersected with Belle River Road (Laban, with typical Hause dissatisfaction, had left the brick house for greener pastures next-doorliterallyto live in a house on Maple). The Memphis homes of the Hause and Raymond families are highlighted on this Riley map from 1906. Son-in-law George Cottington lives directly below Laban. 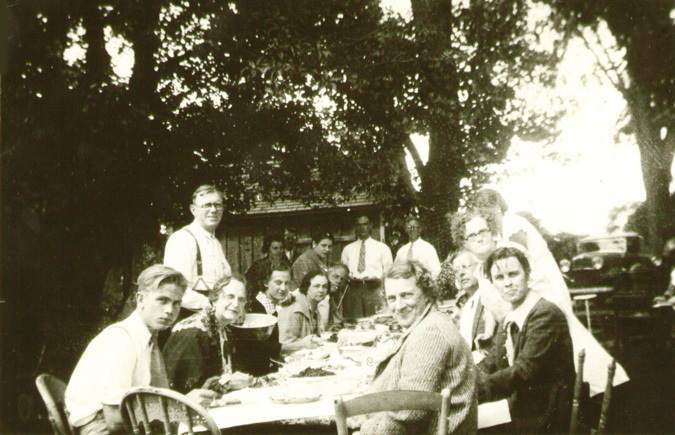 Lovina Sanderson's property (she was the sister-in-law of Melissa's father, David Sanderson) is at right (enlarge). On March 14, 1906, Laban Augustus Hause died, just days after his 75th birthday. 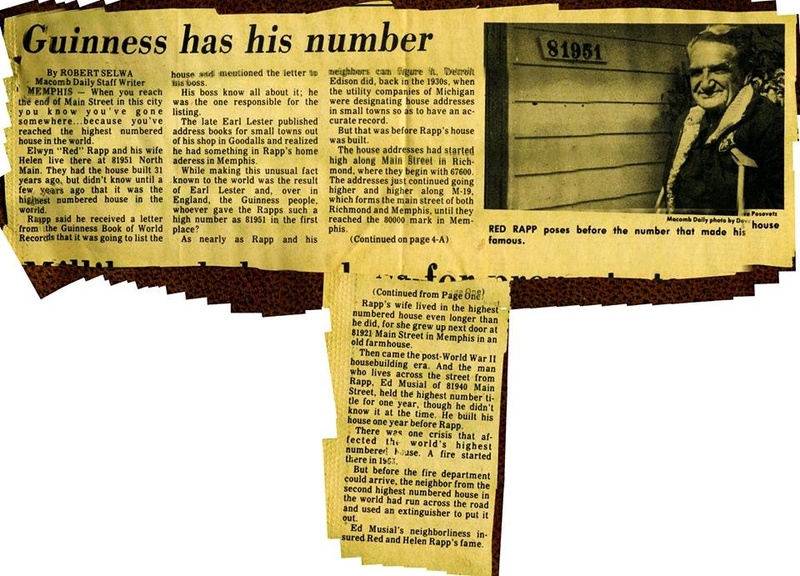 The Memphis Bee reported that, "Although it has been expected for some time, the death of Laban A. Hause which occured last Wednesday morning was a shock to the community. He was one of the pioneers of Riley township, was a member of the methodist church in this village and also a member of the Masonic lodge under whose uspices (sic) the funeral will be held this afternoon." 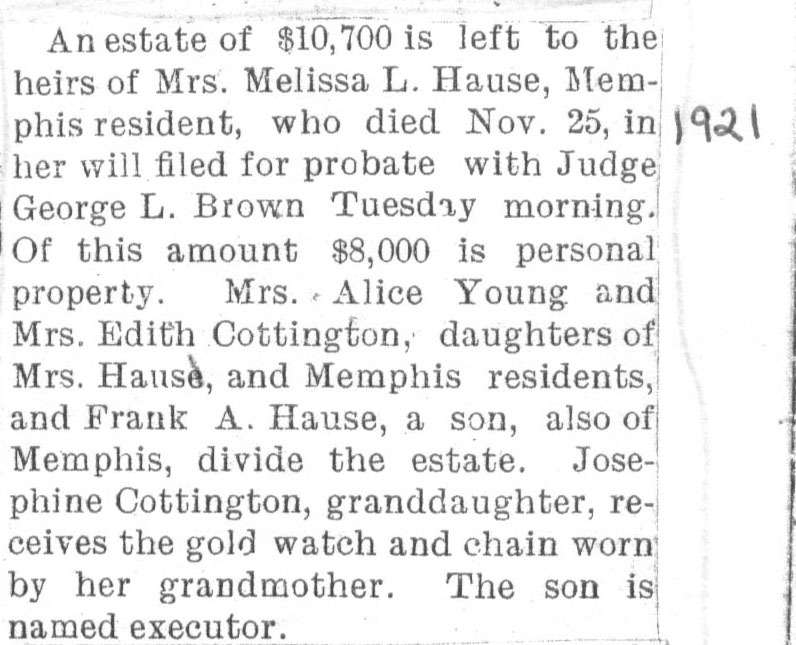 He was buried at the Memphis Cemetery, next to his first wife, Sarah, and his daughter, her namesake. Laban left Melissa with a large frame home that she couldn't tend by herself. So eventually, it was split into two houses that now stand at 34720 and 34730 Maple, in Memphis. The farm outside of town had recently been sold, and the adjoining Sanderson property was sold by Melissa around 1920, toironically and somewhat fittinglythe descendants of the Dysinger family. After Laban's death, his aged siblings followed in a series of sad, bizarre deaths. 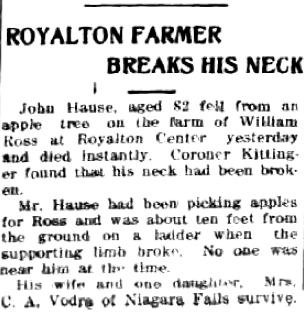 His older brother John was the next to go, when on Tuesday 17 Sep 1912 he fell out of an apple tree and broke his neck, at the age of 82 (North Tonawanda Evening News, 18 Sep 1912, p. 1).⁴ Then 75-year-old Augustus Hause, Jr. died on 23 Aug 1913 in Kalamazoo County, Michigan, while sitting in his rocking chair. 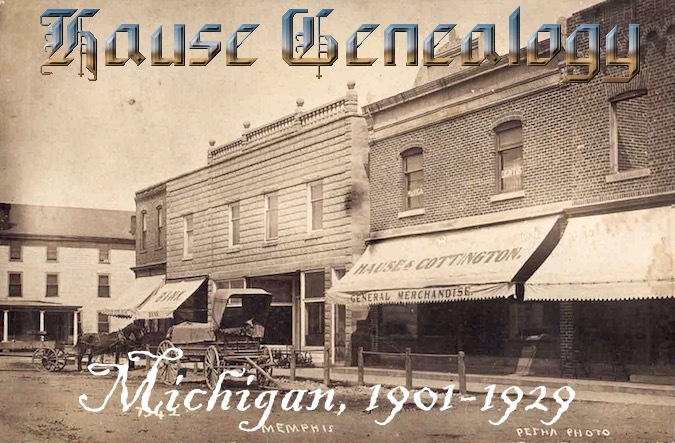 Susan Patt, a descendant of Hannah Grove's older sister, Elizabeth, reports: "My dad's aunt always said, 'Uncle Gus Hause in Scotts, Michigan ...  He died in his rocking chair.'" Augustus's remains were then transported back home and buried at the Ward Cemetery in Wheatfield Township, Niagara County, New York. 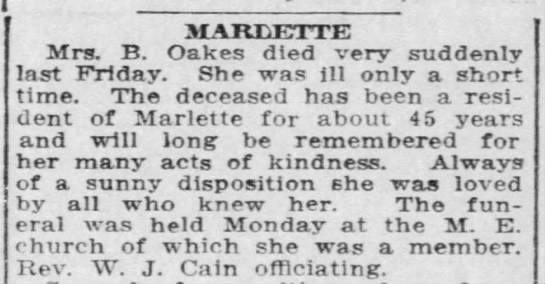 Finally, their sister Basheba died suddenly on 19 Sep 1913 from "acute indigestion" (Port Huron Times-Herald, 29 Sep 1913) at the age of 77 in Marlette, Michigan, while her husband Charles was an inmate at the Eastern Michigan Asylum for the Insane, possibly suffering from Alzheimer's disease or dementia (he died a few months after Basheba on 5 Dec 1913). 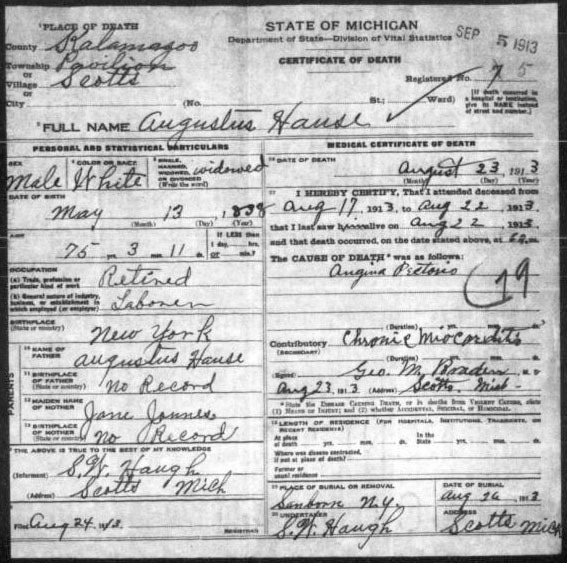 SOURCE INFORMATION: Seeking Michigan Online (http://seekingmichigan.org/); Library of Michigan and Archives of Michigan: Death Certificates. "F. A. Hause returned from his fishing trip Monday evening. 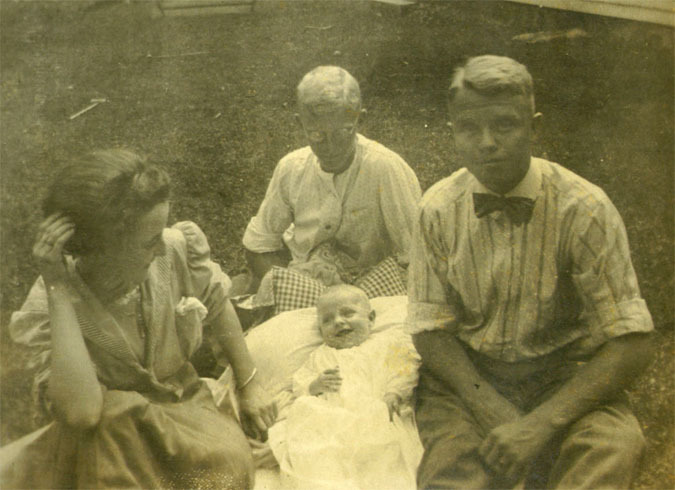 He brought with him a good sized string of fishstories...Elton Cleveland, Carl Hause and the Misses Eileen Wade and Marjorie Marchant spent the week end at Orchard Beach." While the last generation passed, the next line of the Hause family continued to grow. Laban's grandsons Raymond and Carlisle both married in 1911, and were starting families of their ownbut the next Hause to be born in the 20th century would not be either Ray's or Carlisle's: MAURICE (pronounced Morris) CALVERT HAUSE was born on April 5th, 1910to none other than 42-year-old Frank and 4o year-old Fladella. 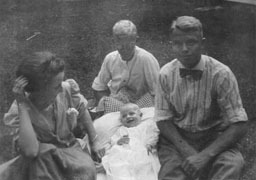 Maurice was regarded as somewhat of a miracle baby, and his full-grown brothers delighted in playing with him and posing for photographs. Frank and Fladella then moved their family in with Melissa at 34730 Maple, in Memphis. Melissa even made a quilt for Maurice with the year emblazoned across it. Memphis itself continued to grow, as well. In 1909, the town council granted St. Clair Electric a 30-year franchise to light the streets. 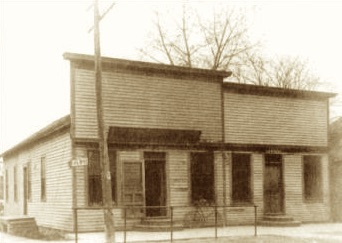 Thirteen lights were installed in the business section, including Frank's store, in hopes that people would soon want light in their homes. The official enumeration day of the 1910 census was the 15th of April. There were a total of forty-six states in the Union, with Utah and Oklahoma being the latest editions and Arizona, New Mexico, Hawaii, and Alaska as new territories. 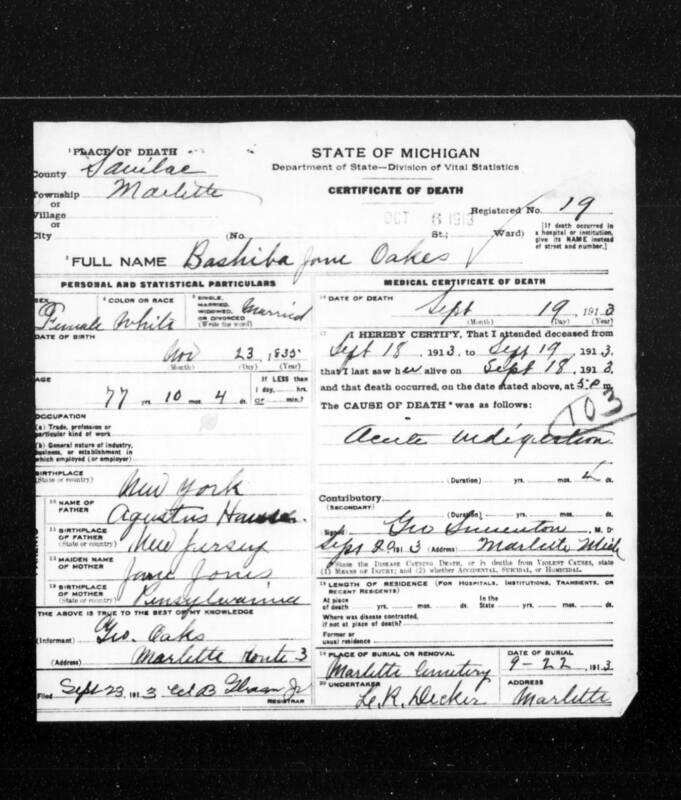 Basheba Hause Oakes was living in Marlette, Sanilac, Michigan, with her daughter, Hattie, while her husband Charles Oakes was an inmate at the Eastern Michigan Asylum for the Insane in Pontiac Ward 4, Oakland, Michigan (he was institutionalized on 22 Aug 1900 and died there in 1913). 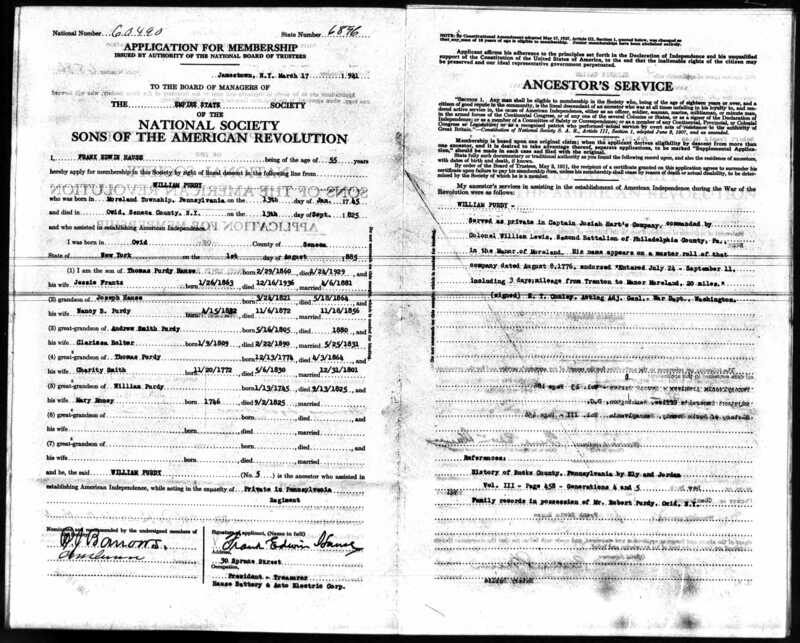 SOURCE INFORMATION: Data imaged from National Archives and Records Administration. 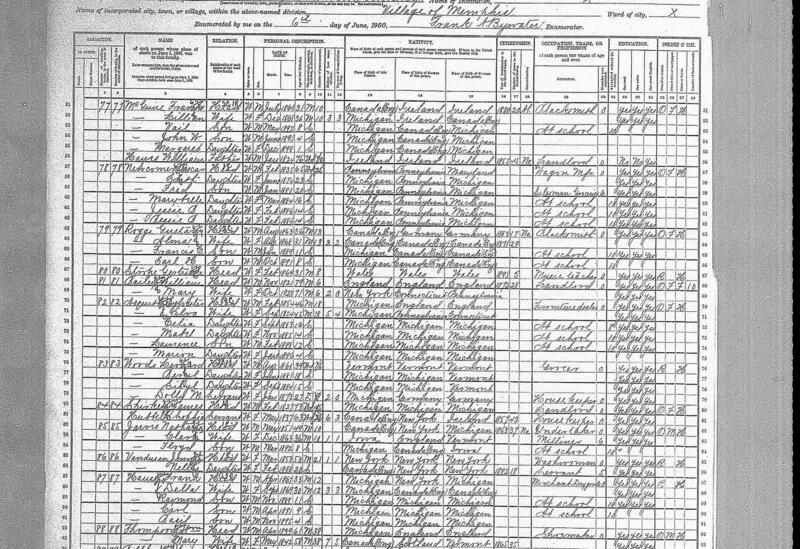 1910 Federal Population Census. T624, 1,784 rolls. Washington, DC: National Archives and Records Administration. By this time, Laban Hause had been dead for several years, and Frank moved his family out of the store and in with Melissa at 34730 Maple in Memphis. 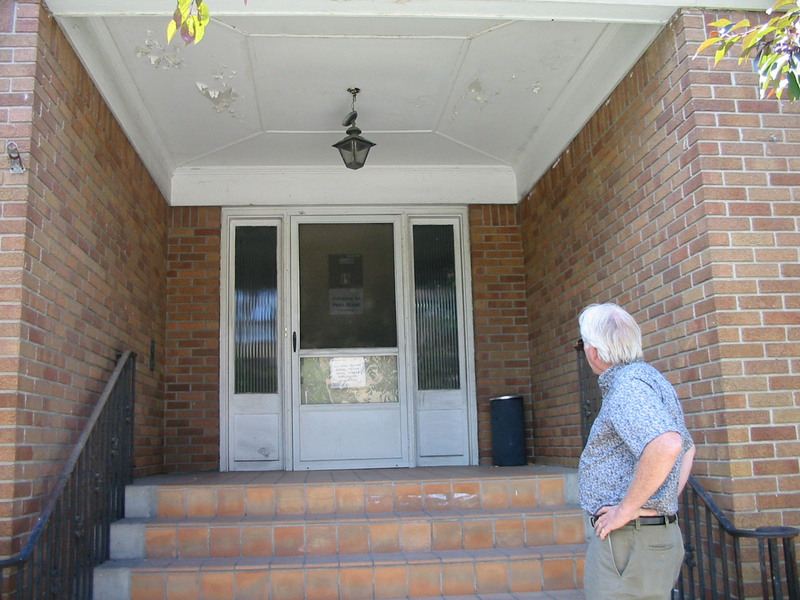 (The house was later split with the western half addressed as 34720 Maple.) 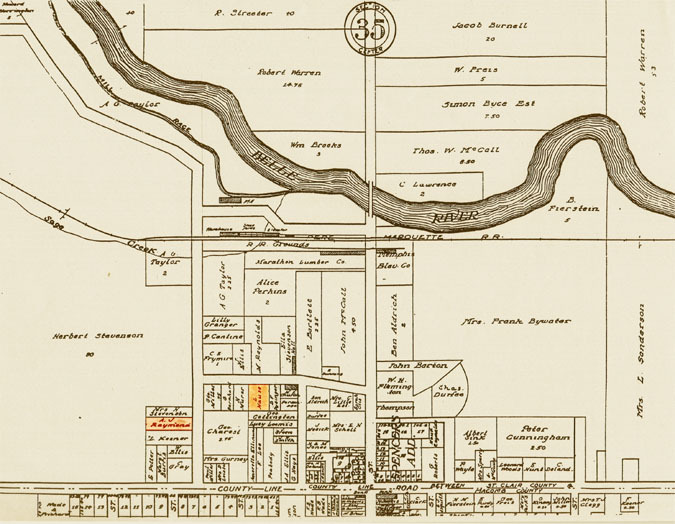 Melissa had also inherited a large chunk of farmland from the Sanderson family, and had become one of the more prosperous landowners in the area. Meanwhile, Frank ran the Hause-Cottington store and was listed in the census as a general auctioneer. All four of Frank's sons still lived at home (although Raymond was working as a commercial soap salesman), but within a couple of years, Ray, Carl and Basil would move away and begin raising families of their own. 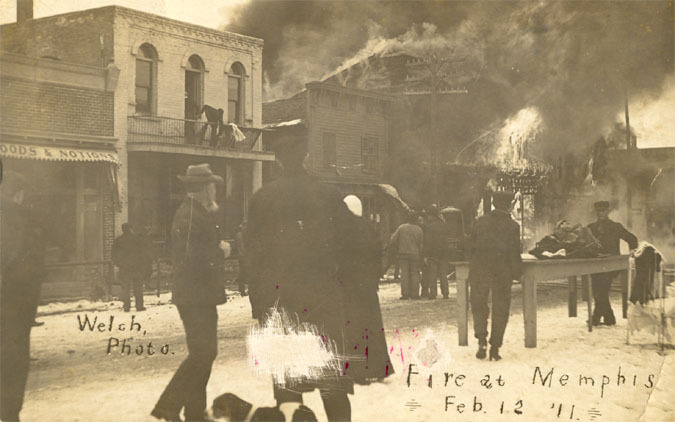 Then on February 12, 1911, a fire broke out in the American House, a hotel that stood south of the Hause-Cottington store. 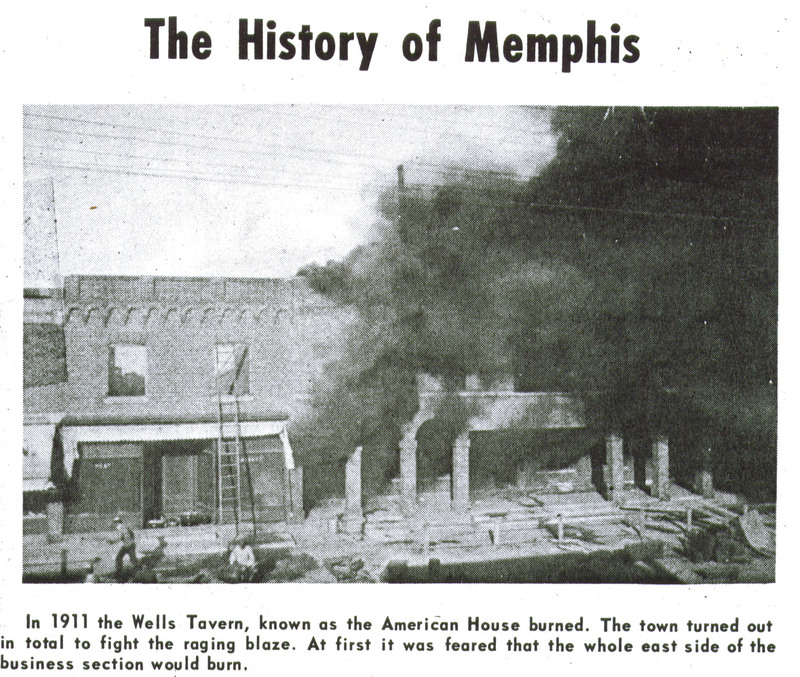 The blaze grew out of control quickly, and it was feared that the whole east side of the Memphis business section would be destroyed. But the town turned out in total to fight its spread, and local legend even has it that Fladella herself saved the drug store building by hanging wet blankets over the walls until the fire could be put out. (In the article at right, you can see how close the fire got to the drugstore). The era of the general store was coming to an end, anyway. 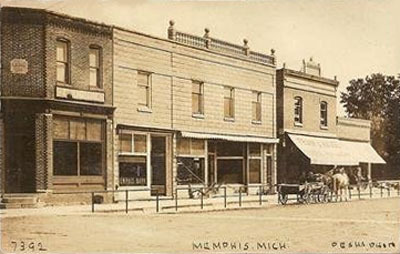 During the first half of the 20th century, general stores were displaced in the rural United States by specialized retailers and chain convenience hypermarts, and the business section of Memphis began to change along with it. A.L. Welch Photo Gallery, Photo Play Theater and Curry Sisters Millinery Shop (photo courtesy of the Memphis Historical Society). A.L. Welch started hauling lumber for his Photo Gallery and Photo Play Theatre at the corner of Main and Potter Street in 1914. He had shows on Wednesday and Saturday evenings. (Those are his photographs of the general store fire, above.) The building and lot where the theater was built also included a millinery shop occupied by the Curry Sisters in 1920. Later, Will Potter purchased the lot and building and continued the shows on Wednesday and Saturday evenings. Giving up his general store, Frank would have to search for yet another profession, and Fladella went to work, as well, making sure that her sons never faced the same problem. She was intent on raising the first generation of Hauses with college degrees. 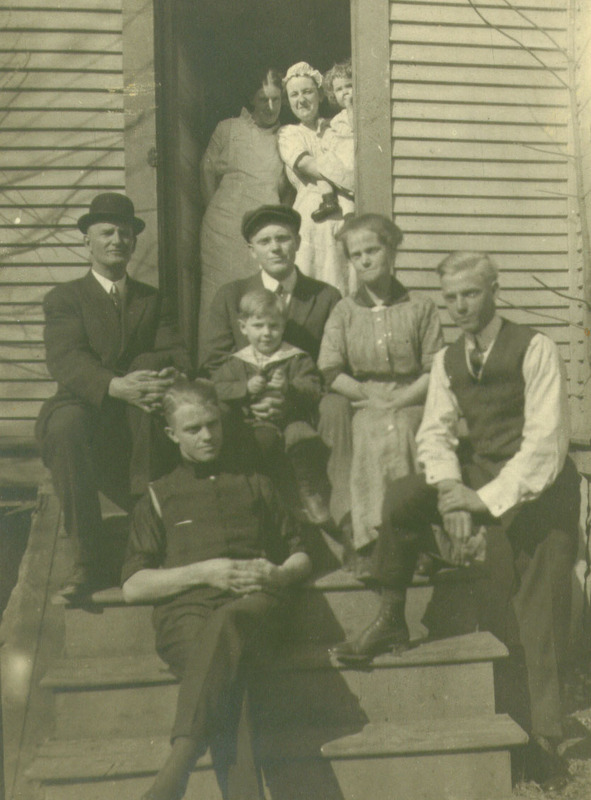 LEFT-RIGHT: Marjorie Marchant-Hause, Basil Hause and Carlisle Hause, who pose around Maurice Hause in 1910; The Frank Hause family posing in the early 1900's (alternate photo); Fladella and Frank on their 50th Wedding Anniversary, 1938. SOURCE INFORMATION: Collection of Carl Hause, Jr.
As the United States entered the twentieth century, high school level education was not for the average person. In 1900, there were only 95,000 high school graduates 1900 in all of the United Statesor about 6.3 percent of the kids at that age level. Then, only about a third of those would go on to college. Melissa Sanderson-Hause was now the matriarch of the familyand the first teacher in the family, as well. So she and Fladella made sure that the next Hause generation was properly educated, and found creative ways to accommodate the cost of their educations. Their determination would change the family foreverthe Hauses went from being a family of farmers, to become a family of teachers. 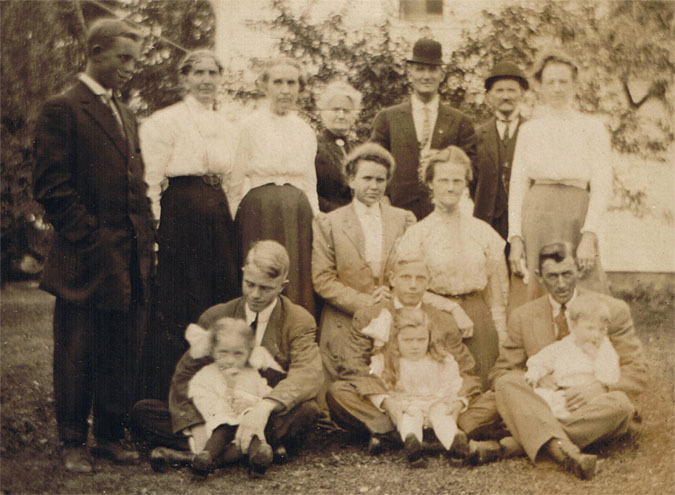 Melissa's grandsons, great-grandson and great-great-grandchildren would become educators. "About 2 O'clock Saturday the door bell rang furiously & before I could get to the door a man called out this house is on fire!" Melissa Sanderson Hause, on a fire at the boarding house that she ran with Fladella Hause, in a letter to her grandson, Raymond, 1920. SOURCE INFORMATION: Carl Hause, Jr.
Over and over again, Hause women have shown their toughness and determination. First, they married a Hause (which, let's face it, was a pretty fool-hardy thing to do), and also when it came to raising their children. Fladella was no exception, and she was determined to give her children a college educationbut it would cost a lot of money, and she had three boys to put through school. 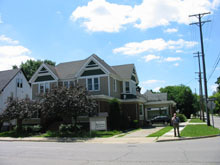 So while Frank stayed behind and took work making hats in Flint, Michigan, Fladella and Melissa moved to Ypsilanti, in Washtenaw County, where they rented a house on Hamilton Avenue and operated a room & board home for the male students of Cleary College, and later to girls from the Michigan State Normal Schoolcalled Eastern Michigan University today. This way, Fladella's sons could study there, as well. The university (founded in 1849) was the first teachers’ college outside the thirteen colonies, and the oldest teachers' institution west of the Allegheny Mountains. 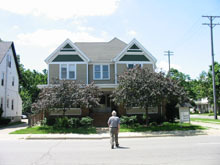 The boarding house still stands today (in 2006), just across the street from the university. Carleton Hause, Jr., approaches the boarding house near Eastern Michigan University in Ypsilanti that was once run by Fladella and Melissa, still standing in 2005. 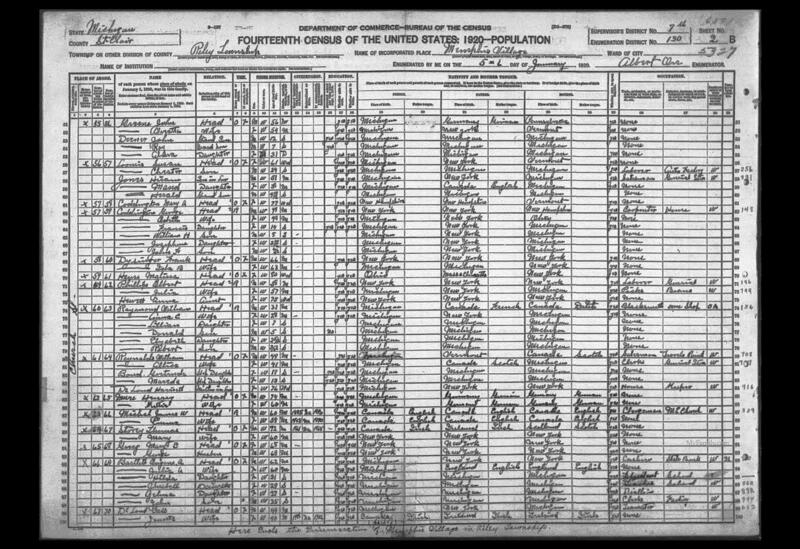 The original 1920 census schedules were destroyed by authorization of the Eighty-third Congress, so it is not possible to consult originals when microfilm copies prove unreadable. 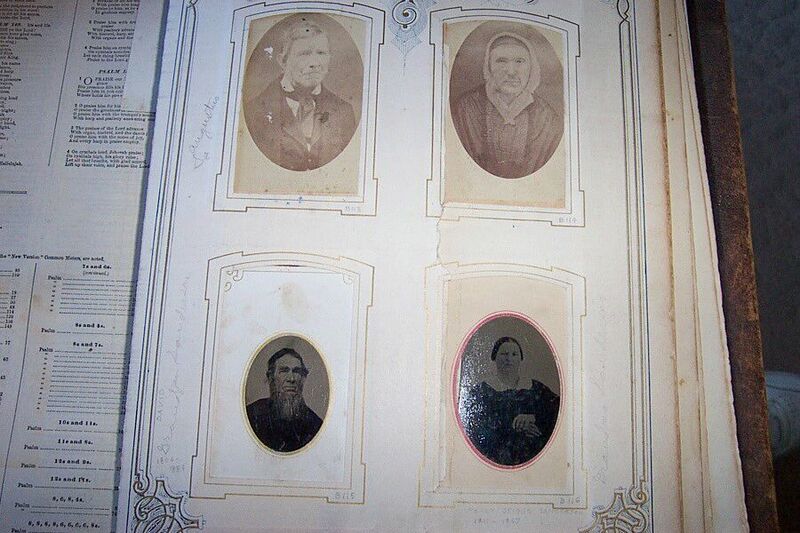 But fortunately, we can still read here that we have a family record of four generations in one census! Melissa was back in Riley Center, while Frank and Della were still living in Ypsilanti. Frank is now listed as "stewart" (with his description of that stewart job as "stewartship"Frank was not one to over-explain), and Maurice is the only son living with Frank and Della. Two of their sons, Carlisle and Basil, were becoming teachers, and Carlisle's son, 2½-year-old Carleton, would one day become one as well. (As would Carleton's son, and his children, too.) Melissa would indeed be proud. SOURCE INFORMATION: Federal Population Census. T625, 2,076 rolls. Washington, DC: National Archives and Records Administration. After their children grew older and moved off on their own, in April of 1921 Frank and Fladella returned to Memphis and moved into the "Raven House" near the south end of town, in Macomb County, at 80125 Belle River Road,³ with 20 acres of farmland in the back yard. Their property was filled with cherry trees, livestock, and everything the Hauses needed to live. It was the hub of family activity for the next twenty years, and most of the family reunion and party photos on these pages were taken there. 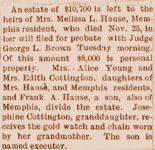 Half of the purchase was made with funds saved by Fladella from her work at the boarding house, and Frank found work with Deteroit Edison (probably at the Belle River Power Plant).⁵ More money was coming, if in an unhappier fashion: Melissa Hause died on November 25, 1921, leaving an estate of $10,700 in her will. Frank, now the head of the family, was named executor. By 1925, Frank was doing well enough that he could afford to quit Edison and work the Raven farm full-time. 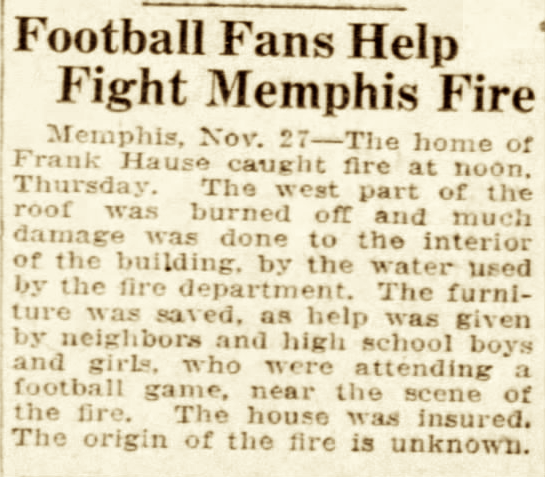 But it was almost all for naught, as on November 26, 1925, the home was nearly lost to fire. The west part of the roof was burned off and there was a lot of interior damage by the water from the fire department. Still, the Port Huron Times-Herald reported that the furniture was saved, thanks to students of the high school who were attending a football game down the streetI can't help but picture the cheerleaders and band cheering the students on as they removed the furniture from the house. 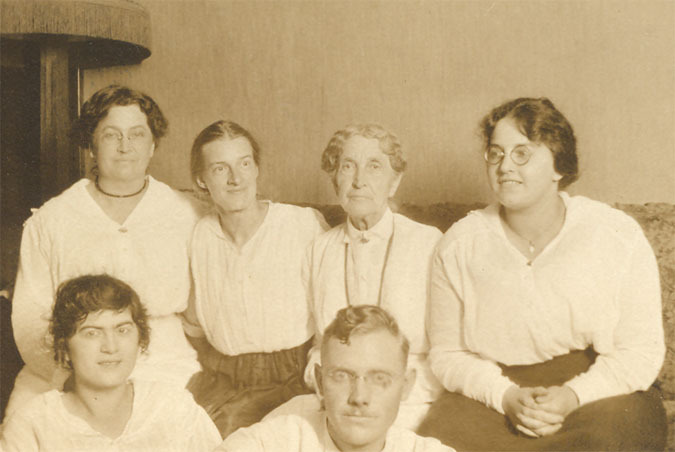 Clockwise from lower left: Carleton Sr., Aunt Edith Hause-Cottington, Raymond (standing), Cousin Margaret, Marjorie Marchant Hause, Carlisle, Basil (standing), Frank Huber, Fladella (standing), Hazel Hause, Ethel Yale Hause. 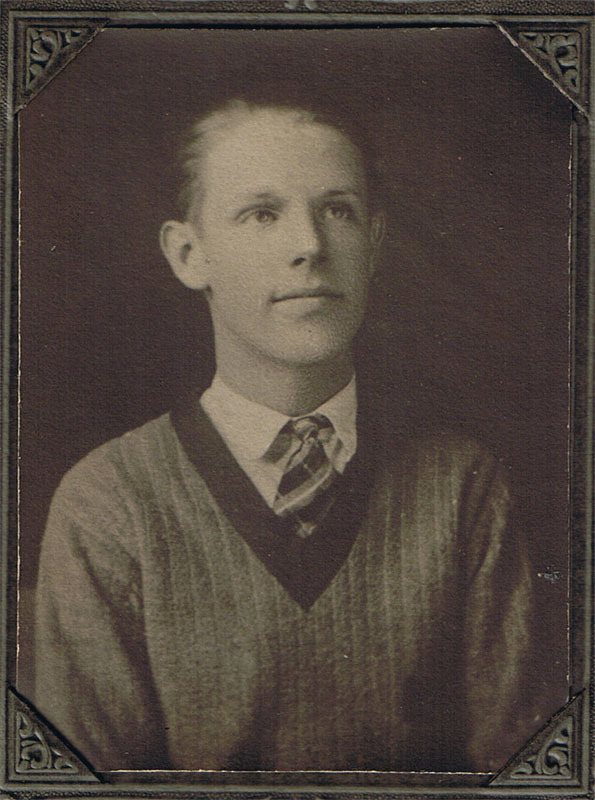 Maurice Hause at age 15 (click to enlarge). After Melissa's death, another Hause generation was gone. 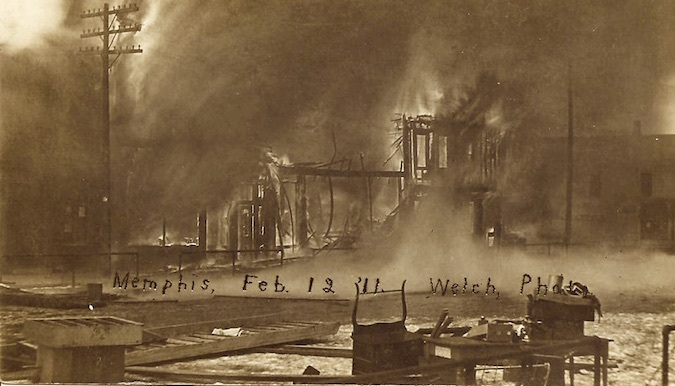 Laban's Memphis farmhouse fell into disrepair over the next century, but it remained a landmark in the area until burning in 1986, leaving only the windmill and barn standing. The entire estate was completely demolished by 2005. Most of the bricks were hauled away to build other farmhouses, and the forest has since reclaimed the land. The next death in the Hause family, however, was completely unexpected. In 1926, Maurice Hause died from pneumonia that he contracted while on a trip to the movie house in Richmond, just a few weeks before his sixteenth birthday. By all accounts he was a popular, delightful kid. According to the Port Huron paper: "Maurice Franklin Hause was born in Memphis April 5, 1910 and was called to the Great Beyond by our Heavenly Father, March 19, 1926. Maurice was a boy much loved by the whole community, and his fine and manly principles will be missed in the future welfare of his home, his church and classmates. The high esteem in which he was held by his school associates was evidenced by their last fine tribute paid him. Maurice has spent most of his aggressive life in Memphis, returning from Ypsilanti in 1921 with his parents, Mr. and Mrs. Frank A. Hause. His interest and enthusiasm in home, church, music and school was an inspiration to all who knew him. 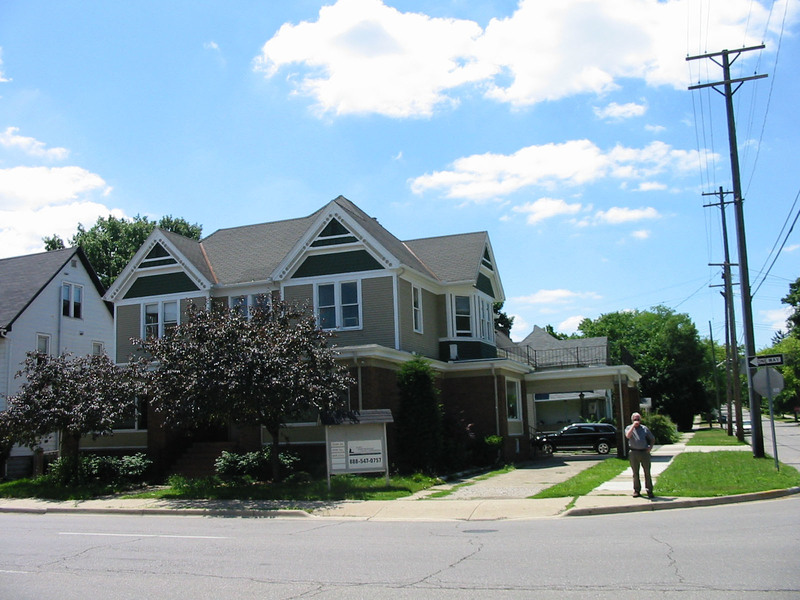 Maurice was received as a member of the Methodist Episcopal Church by letter, having previously joined in Ypsilanti. Besides his parents he leaves three brothers, Ray L Hause, San Diego, California; Carlisle Hause, Detroit; Basil F. Hause, Mishawaka, Ind., and a host of relatives and friends." The effect on the family was profound, if unspoken. Perhaps the death was too painful to bring up, because he was never spoken about againin fact, when his grave was discovered among the rest of the Frank Hause family's by some descendants in our line a few years ago, nobody knew who he was. It was only after reading old obituaries that his identity was deduced. Clockwise from upper left: Carlisle Hause, Emmy Hause, Michele, Jeff, Kathy, Eric. 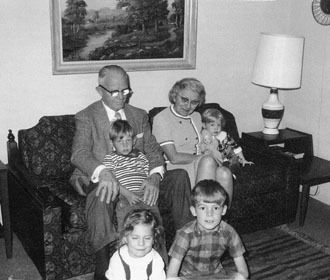 1891 - 1972: The rest of the country catches up to our family in general poverty; Frank and Fladella remain in Memphis; Carlisle (pictured at right with 2nd wife Emmy and great-grandkids) moves to the Big City, then goes a little country; Carlisle begat Carleton Sr. who begat Carleton Jr., who will follow Carleton Sr. west, to find better jobs in California. ¹In an interesting twist, genealogist Alfred Hause married back into the Loescher family (now spelled "Lasher" page 150), marrying his distant cousin without even knowing it! (He never got far back enough to discover the connection.) His wife Henrietta Lasher's line included Anna Margaretha Loescher, the mother of Sarah Wheeler, who many genealogists believe married Johannes Haus @ 1750 and gave birth to William Hause. Now that's dedication to retracing your roots! 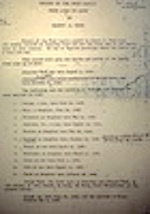 ²Although Alfred's finished work on the Hause family has never been located, he did complete a history of the Purdy family: Genealogy of the Purdy family, nearly complete record of the descendants of John Purdy, 1742-1905 by Hause, Alfred B; Genealogical Society of Utah, 1942: Salt Lake City, Utah. Located at the Repositories Family History Center: (Donations: Bound) Hause, Alfred B.Purdy Family, bound manuscript, 464 pages. Also at the New York Public Library, Schwarzman BuildingMilstein Division Rm 121; Call No. NYGB AZ Fam 09-420. Record No. b18135475. 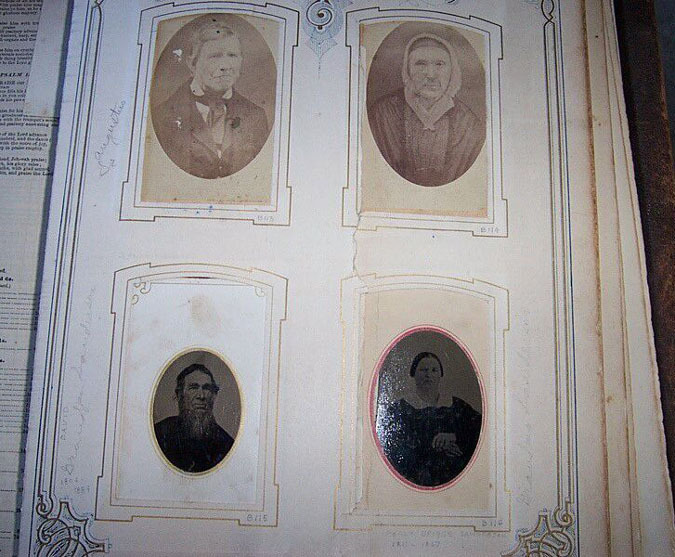 Click on the photo, at right, to see the pages that he wrote on his parents and brothers. ³In 1973, Memphis was listed in the Guinness Book of World Records for having the highest numbered house in the world: 81,950 Main Street. Houses 1 through 81,949 had no comment. ⁴Apple picking in Niagara County was quite a bit different than the process is today, with dwarf trees and tractors. Back then, standard tree height exceeded thirty feet and those picking the crop usually worked from 35-foot ladders in order to reach some of the fruit. It was also an unwritten law that once a picker began to pick; he would not leave a tree until all the apples were off. Not to be judgemental, but they wouldn't send an 82-year-old man up a 35-foot ladder leaning against a fruit tree today, either. 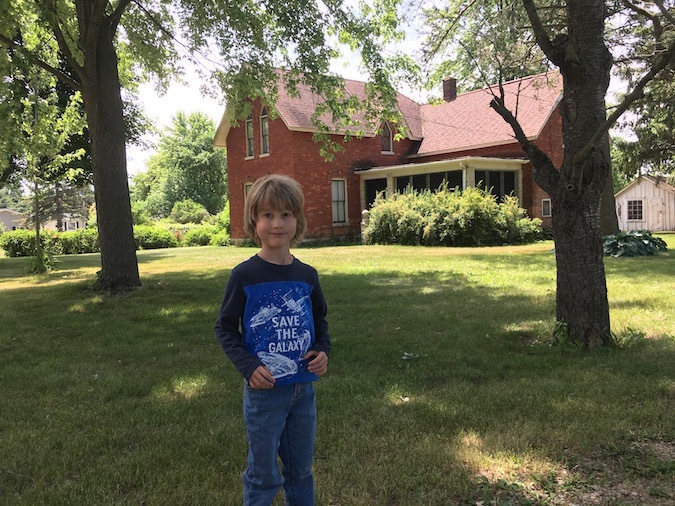 Atticus Hause standing in front of the house of his great, great, great-grandparents in July of 2018. St. Clair County, Michigan, its history and its people : a narrative account of its historical progress and its principal interests, by William Lee Jenks, 1912. 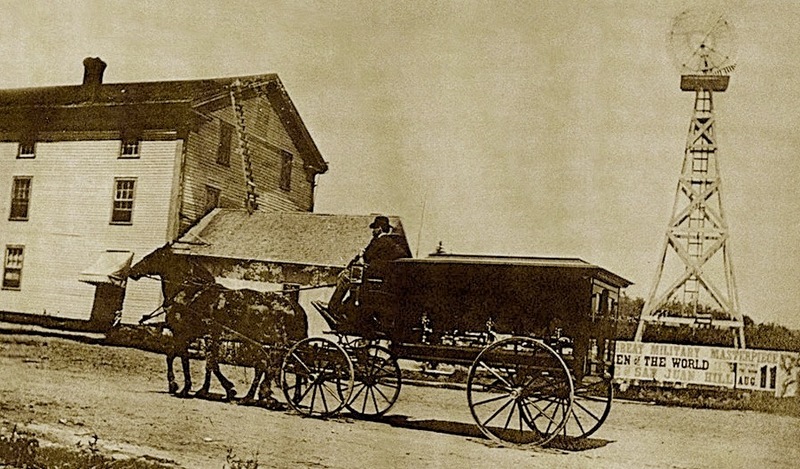 TOP PHOTO: Early 20th Century photo of Main Street in Memphis; a horse is tied to the hitching post in front of Frank Hause's store (the last building in the photo, nearest the wind mill). The south half of the store (where the windmill stands in the photograph) was built in 1907. 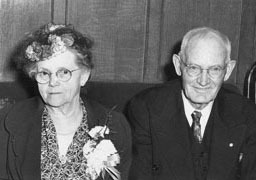 Melissa poses with Raymond Hause (front) and his wife, Ethel Yale-Hause (on Melissa's right).